In 2012, the release of Journey on the PlayStation 3 changed the way people saw video games. The emotional experience and manner in which the game touched the player was revolutionary for its time. One of the visionaries behind the majesty of Journey was Matt Nava, whom now serves as Creative Director and co-founder of Giant Squid Studios. 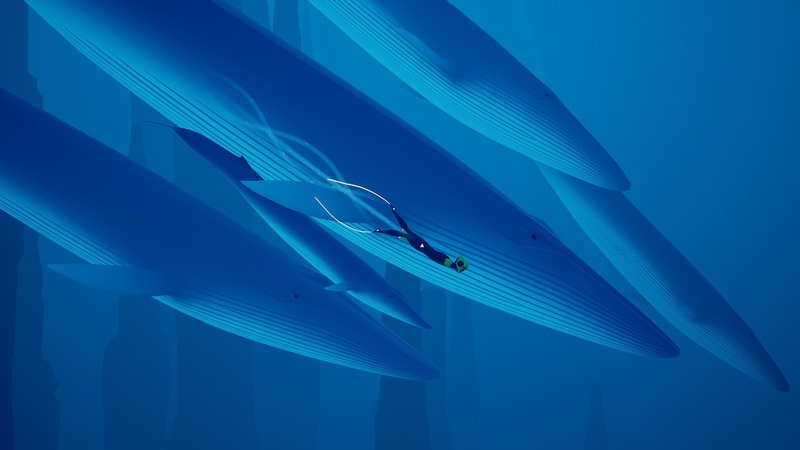 In 2016, Nava and Giant Squid Studios would gift the world with their first video game release – ABZÛ. A couple of years have passed since its original launch, but ABZÛ is now swimming its way to the Nintendo Switch and bringing with it an experience unlike anything you’ve ever played or listened to on a Nintendo system. ABZÛ is as much a game as it is art. No two people will connect with the game in the same way. Some may be moved by the unspoken narrative, as you feel a connection to the aquatic life and environment. The experience is heightened by the masterful musical composition crafted by Austin Wintory. Each note amplifies the events on screen and has the power to touch your inner soul, as you immerse yourself and become emotionally attached to the happenings in the game. ABZÛ is a deeply personal experience and one that you may not fully understand upon completion, but you will recognize the game’s power to move you and reach into your soul. The player assumes control of the Diver, a mysterious lead character that is silent but is able to ping nearby underwater drones for assistance and birth forth aquatic life in select locations. The Diver is an adept swimmer, which is fitting as ABZÛ takes place entirely in a subaquatic landscape. Over the course of the journey, there are simple puzzles to solve that require the player to explore the environment. Featuring several distinct locales, ABZÛ consistently feels fresh and exciting as original music welcomes you to each new location and unique aquatic life surrounds you. It is within these areas that the game’s mystery begins to reveal itself to the player, as you discover hieroglyphs and other relics of a time long forgotten. What makes ABZÛ such a mesmerizing experience is the tandem work of its brilliant sound design and alluring visual style. ABZÛ is a true wonder to behold, as each new area flourishes with life and its own identity. You never feel like you are in the same area twice. Each setting is its own independent environment with its own aquatic populace. As you swim and explore each area, there are secrets that, once discovered, shall burst forth greater aquatic life for you to observe and appreciate. While the visuals attract, it is the music that entices you to stay. The soundtrack of ABZÛ heightens the immersion one will have with the game as each note perfectly reflects the environment and represents the emotion being depicted on screen. Whether highlighting the tranquility of the ocean during meditation sequences, building in intensity during key swimming sequences or conveying an underlining sense of vulnerability during points of ambiguity, the music will impress until the final credits sequence concludes. Having originally played ABZÛ on PS4, I worried that the transition to Switch would compromise the game’s visual fidelity, but my fears were put to rest immediately. In fact, ABZÛ suits portable play quite well and feels at home on Switch. The game performs beautifully whether docked or undocked — though I found myself preferring undocked mode because it allowed me to immerse myself more fully into the game. Resting on the couch and plugging in a pair of headphones granted me passage to experience the game in a new light.